Brain teasers, mind benders and 42 (2007) | Randomwhoness: a Doctor Who blog by Johnny Spandrell. Sampling stories in random order. And so Steven Moffat is going to hand over to Chris Chibnall after Series 10. With the best will in the world, it’s fair enough to say that his ascension to the showrunner’s swivelly chair has not been met with the same anticipation as the Moff’s. Moffat had written four highly acclaimed Doctor Who stories before he took over the show, as well as a string of TV successes including the much praised update of Jekyll. 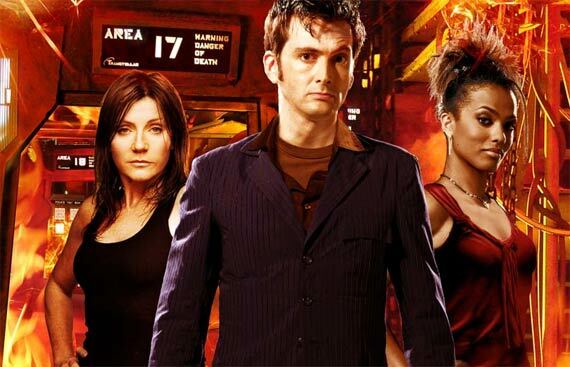 Chibnall has written four, well, not so highly acclaimed Doctor Who stories and was lead writer on the first two series of Torchwood (both of which had mixed reviews). Never mind that he also has a string of TV credits, including the much praised (at least in its first season) Broadchurch. He’s not the guy who wrote Blink, he’s the guy who wrote The Hungry Earth, so although it’s chronically unfair to judge him before he does the job, that’s exactly what a lot of folk will do. I doubt if Chibnall cares. A fan of long standing, he knows what an unforgiving lot Whoheads can be and was no doubt prepared for a certain amount of backlash. In fact, he was part of that fervent mob back in 1986, when he went on telly to chastise Pip and Jane Baker for their work on The Trial of a Time Lord. Jane’s no longer with us, but we can only hope that Pip will get his own back in 2018, on a live talk back special or something. “I think the dialogue is far too pedestrian and there should really be a wicked female scientist of some sort,” I hope he says. Anyway, to 42, and via it to the rest of Chibnall’s Who work to see what might be divined about his approach to the series once he gets his grubby little protuberances on it. It’s difficult to see from his grab bag of episodes what particular slant he has on the show, because he seems to have always been given a tight brief to work with. He seems to be the guy who writes Who to order. 42 has a particularly clear brief – to write a ‘race against the clock’ episode and set it in real time. Chibnall’s script works well within these strictures. These sort of stories work by heaping problem upon problem on our heroes until quite late in proceedings, so that it seems there’s not enough time left for everything to work out well. The challenge is for a resolution to emerge at the last minute that seems logical, but not coincidental. Chibnall’s pacing of events throughout the episode, combined with vibrant direction from Graeme LOTSOFLUVERLYENERGY! Harper, means he pulls off this trick. The finished product holds the audience’s attention firmly, if not quite nail bitingly. What he doesn’t manage is to create particularly interesting characters. The crew of the good ship Pentallian are generic sci-fi crew member fodder. Only Michelle Collins as Captain (Go on – see if you can remember her character’s name without looking it up) and perhaps William Ash as (Go on – have another go), a sort of love interest for Freema Agyeman (if you can’t remember her character’s name, you’re reading the wrong blog), make any lasting impression. Chibnall’s next story, The Hungry Earth/Cold Blood has a similarly lacklustre supporting cast, but by the time we get to his two Series 7 stories, he’s changed approach and given us characters derived from strong established archetypes (big game hunters and UNIT’s scientific advisers), allowing him to vary his line ups from my generic angsty humans under pressure. There is a pattern there, in those collections of odd bod humans, often in isolated situations, struggling to make sense of an alien threat they don’t understand. So far, so Doctor Who I hear you say. Perhaps that in itself is a Chibnallesque trait: he understands the fundamentals of Doctor Who, and doesn’t seek to subvert them as Moffat does. If so, we might be illuminating one reason why Chibnall’s rise to the top job hasn’t filled everyone with joy: to date he’s demonstrated he knows how to make good Doctor Who, but not innovative, ground breaking Doctor Who. We might well expect more new Who that feels like old Who from a Chibnall series, which may please many a old fanboy and girl. And surely 42 is the epitome of that. After all, it is effectively set in one long corridor that people spend a lot of time running up and down. Philip Hinchcliffe has said about Terror of the Zygons that a lot of brilliant work on a Doctor Who story can be undone by one dud special effect. 42 shows us this is also true of dud plot elements, where the credulity-stretching pub quiz questions which open the various bulkhead doors, sticks out like an unsightly scratch on an Elvis LP (pre-download, you understand). It’s a half-hearted gimmick, which no-one has the enthusiasm to see through to the episode’s end. (Although you can see how a fiendishly difficult last door question with Martha having to guess the answer with seconds to spare might have worked). I think it’s this hokey element which stops what is otherwise a slick and stylish episode being more fondly remembered. Still, I think a trick was missed. In an episode called 42, and one featuring a ship falling into a sun, we might have expected a bit more hat-tipping to Who alumnus Douglas Adams. Surely one of those brain teasers should have been ‘what’s the answer to the ultimate question of life, the universe and everything?’. Deep Thought would have approved. LINK TO The Krotons: both require the Doctor’s companion to answer a set of quiz questions. NEXT TIME: We are put down right in the middle of the French Revolution. Yes, The Reign of Terror.